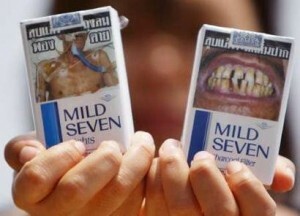 Thai cigarette packs, with graphic health warning labels. Cigarette makers have blocked use of such labels in the U.S. through a lawsuit. A newly-released study of previously secret, internal tobacco industry documents shows the multinational cigarette companies have been working consistently behind the scenes since 1966 to 2012 to block stronger health warning labels on cigarette packs. On-pack health warning labels are an effective and inexpensive way of educating the public about the health hazards of smoking. For decades, countries around the world have been trying to make these labels more effective, for example by using more strongly-worded warnings, or graphic photos of tobacco-related diseases like cancerous lungs, people with tracheotomies or rotting teeth. But cigarette companies view these improved labels as a “global threat” and formed international task forces to block their use. If, despite cigarette makers’ efforts to block them, laws requiring clearer health warning labels do pass, cigarette companies work to repeal them. “There is no country too small for [tobacco companies] to intervene,” says Stanton Glantz, director of the University of California San Francisco Center for Tobacco Control Research and Education, who created a timeline of the industry’s 50-year battle against better health warning labels. The tide started to turn for governments in 2003, after the World Health Organization adopted the first-ever global treaty for tobacco regulation, the Framework Convention on Tobacco Control. The treaty requires signatory countries to mandate the use of improved health warning labels. With the force of this treaty behind them, many countries including Canada, Australia, Brazil and Thailand, have forged ahead and adopted enhanced warning labels. But the U.S., which failed to ratify the treaty, is lagging behind. In 2011, the U.S. Food and Drug Administration announced new rules requiring large, graphic health warning labels on cigarette packs, but tobacco companies joined together to sue the FDA over the requirements, saying the labels violate their freedom of speech. The court ruled in their favor and granted an injunction against the labels, effectively blocking their use. Studies show graphic health warning labels are extremely effective, which is why the tobacco industry works so hard to oppose them. See a short video about the issue here. The full study is available from Tobacco Control journal here. ← Whatever Happened to the 2010 TV Commercial Volume Law?